The Master Builders KwaZulu-Natal Zululand Fishing Competition took place over the weekend of Saturday the 6th and Sunday the 7th of November 2010. The weather didn’t quite play its part with some preferring the sanctity of the club house over bad weather and intimidating seas. While the competition was officially called off for the day, Saturday saw 11 of the 18 boats entered brave the weather with some laying claim to some very impressive catches and bragging rights. Sunday saw a drastic improvement in weather with all 18 Boats taking to the water. Of the 18 crafts entered, two were from the south coast, one from Durban and one from Pietermaritzburg. In total 65 Fisherman took part on a day where ahead of nearest rival boat "Big W", first prize went to a vessel called "Not Guilty" for their 13.5kg Dorado catch. 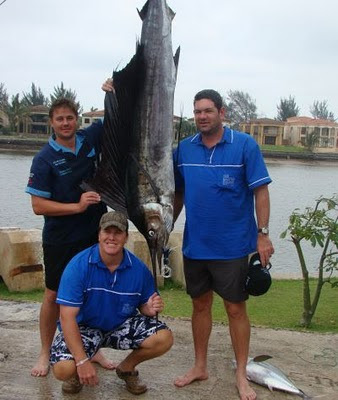 Throughout the competition a small number of Marlin fish were caught and released. Wayne Ritchie of vessel "Big W" managed to land two Marlin on the day, making him recipient of The Bull Fish Prize. Is Longevity A Time Bomb In South Africa? Blogging Is Effective, Ask Julius !! !